Yes, it's that time of year again. Can you believe it? My how time flies! We thought it only appropriate to wish everyone a Happy Halloween this year with a little #ad to remind you, that well, much like Halloween, juicy stories are what Amy Puchaty Communications LLC is all about. Whether it's spinning a story to spread the word for an event, showcasing a property in the best possible light, or polishing your bio to perfection, we'll craft a one-of-a-kind message that cuts to the heart of what makes your product, brand, or service, unique and special. One part strategy, one part magic...ahem, creativity...Amy Puchaty Communications decodes your every wish to cast a spell on your consumers, clients, and friends. Let's collaborate, let's shake things up, let's make things happen. Give us a ring or shoot us an email. You'll be glad you did. Guest Post Alert! This week we are pleased to feature a post from guest blogger and design consultant Catherine Collins who fills us in on what's trending in Minimalist Bathroom Design. Catherine is a passionate home design consultant from Melbourne, Australia who loves making homes beautiful and buildings sustainable. She is a regular contributor to Smoothdecorator.com. Follow her tips and tricks on Twitter. Minimalism is one of the most popular interior design styles today. People mostly decide on it for its functionality and peaceful and uncluttered look that turns every space into a personal retreat from the noise and chaos of our modern lives. So, if you want to introduce minimalism into your home, a good place to start from is the bathroom. Here’s a little guide on how you can turn your cluttered bathroom into a clean, lean and modern space. Soft neutral colors such as white and gray look elegant and classy in every space, especially in a minimalistic bathroom. They make the space seem open and bright, even if you don’t have much space to work with. Bright colors are great in reflecting light, so you won’t have to fill your bathroom with a variety of lighting fixtures and overburden the space. If you combine the sleek white walls with a few touches of wood and concrete for warmth and texture, you’ll create a space that has character but still stays true to the simple aesthetic of minimalism. Even though white usually prevails in minimalism, dark-colored and metallic elements create an interesting contrast and nicely break the monotony. Dark metal fixtures, door and cabinet handles, lighting fixtures and other small details in contrasting colors make a daring statement without creating unnecessary clutter and disturbing simplicity of design. One thing that minimalism hates is clutter. Keep your bathroom free of empty shampoo bottles and half-used soaps, and only hang on to the essentials. Keep things you use every day, and get rid of all clutter that’s good for nothing else than collecting dust. If there are some things you don’t use often but just can’t get rid of, you should store them in closed cabinets. For instance, a simple wall mounted cabinet with a mirror will keep your toiletries hidden and not take too much space. However, don’t think you can fill up your space with closed storage and get away with it. It’s still considered clutter, so keep your furniture at a minimum. Minimalism doesn’t agree with anything that doesn’t have a practical use, so go easy with decoration. A lot of decoration is going to close off the space and make it look cluttered (even if it’s not). However, one or two straightforward decorative pieces will add a nice warming touch to the space, instead of creating a crowd. Greenery is always a good choice if you want to add a splash of color and still keep it simple and natural. However, even though almost everything has to have a function, make sure that they perform their function in an elegant and efficient way. An ugly and old soap dispenser should be repaired or replaced even if it still serves its purpose. As minimalism is all about simple and smooth lines, the same has to be present in your bathing area, no matter if you have a bathtub, walk-in shower or a simple shower unit. Most interior designers today opt for a sleek freestanding bath to serve as a focal point in a minimalist bathroom. These tubs are usually very simple, yet still manage to attract attention. ​Walk-in showers are also quite popular but require significant space in order to look well thought-out. If you don’t have that much space, you can grace your bathroom with a frameless shower unit that blends with the rest of the space. The absence of the frame will take up no visual space which will make the bathroom seem more open. The space that’s dirty can never be considered attractive and elegant, so don’t leave towels on the floor and wipe down all surfaces every day. This doesn’t take a lot of time, but it will give your bathroom a clean and fresh feeling. If you’ve always wanted to live a more organized and simple life, you can start from your bathroom. Try it out, and you’ll surely let minimalism into the rest of your life as well. Are you an expert in luxury real estate, interior design, or a related field? Amy Puchaty Communications is a proud supporter of aspiring writers and bloggers looking to broaden their reach. If you are interested in contributing to the Amy Puchaty Communications blog, AtHomeWithAmy, email amy@amypuchaty.com. Press Release by Amy Puchaty on behalf of DMAR & AREAA Greater Denver, As Seen In: The Denver Post, Real Estate Section, Sunday, October 22, 2017. This week it was my pleasure to secure a client press release in The Denver Post Sunday Real Estate section. The press release announces details on the upcoming 2018 Colorado Luxury Summit presented by Denver Metro Association of REALTORS® (DMAR) and Asian Real Estate Association of America (AREAA) Denver Chapter. Read the full press release below, and don't forget to snag your tickets to the 2018 Colorado Luxury Summit before it's too late! (COLORADO, Oct. 2017) – The Denver Metro Association of REALTORS® (DMAR) and the Asian Real Estate Association of America (AREAA) Denver Chapter proudly announce the first annual 2018 Colorado Luxury Summit – a curated, two-day event of thought-provoking classes, sessions and content designed to elevate real estate businesses in Denver, held at the JW Marriot Denver Cherry Creek, February 22-23, 2018. Registration is now open to the public with exclusive discounts available for DMAR and AREAA members. A single ticket includes admission to the highest caliber real estate summit of the year, access to a trade show style exhibition hall, discounted room block at the JW Marriott, and signature events including: General Sessions, Six Breakout Sessions, and Closing Wine Tasting Reception. A limited number of tickets are available for purchase starting at $199 for general registration, to VIP tickets for $250 which include one general registration ticket, one keynote luncheon ticket, one valet parking pass, and VIP seating in the Grand-Room. Group Sponsorship of Grand-Room Tables for eight are available for $2,100. About DMAR: The Denver Metro Association of REALTORS® (DMAR), The Voice of Real Estate® in the Denver metro area, is a membership-based organization dedicated to the advancement and protection of the real estate industry. With more than 7,000 REALTOR® and Industry Partner members across the Denver metro area, we are currently the largest local REALTOR® association in Colorado and the 36th largest nationwide. About AREAA: Founded in 2003, the Asian Real Estate Association of America (AREAA) is a nonprofit professional trade organization dedicated to promoting sustainable homeownership opportunities in Asian American communities by creating a powerful national voice for housing and real estate professionals that serve this dynamic market. Do you have a special event to announce, market analysis to share, or a record you've shattered in a certain neighborhood? Give us a call. We would love to help spread the word. Guest Post Alert! This week we are pleased to feature skilled loan officer, Miranda Rigali of Fairway Independent Mortgage in Greenwood Village, Colorado. Miranda Rigali is committed to taking great care of people who are looking to buy or refinance a home in the greater Denver Metro area. Miranda has been in the mortgage industry since 2006. She enjoys working for Fairway because she loves assisting people with the biggest investment of their lives, and helping to make their dreams of homeownership come true! Follow Miranda on Facebook ​for expert tips and advice. After graduating from The University of Kansas, Miranda spent time working in the mortgage industry in Overland Park, KS, before coming to Fairway. She loves her faith, her family, and her job. As a native to Wyoming, Miranda travels between Colorado and Wyoming, visiting family and friends, and finding new places to explore in the great wide open. Camping and four-wheeling are her favorite things to do. Miranda lives in Broomfield with her husband, David, and their three young boys. She is involved in her parish and her children’s school. "My favorite part about where I work are the core values and principles my company is founded on," says Miranda. Fairway Independent Mortgage Corporation was founded in 1996 by Steve Jacobson. Just five years after opening its doors, Fairway reached the $1 billion funded mark. With a strong focus on purchase business, they continue to grow each year, funding $17.5 billion in 2016. Customer service is a way of life at Fairway, which is why it is a good fit for Miranda whose attention to detail and high level of customer service are unmatched. Not only is Fairway dedicated to finding the best rates for their customers, they also offer some of the fastest turn times in the industry. "Our goal is to act as your trusted advisor, providing highly personalized service and guiding you through every step of the loan process. It’s all designed to exceed your expectations, guarantee your satisfaction, and earn your trust," she explains. "Our main priority is ensuring that the trust we are given is backed by accurate, on-time paperwork delivered with the best technology available. We strive to streamline the mortgage process for our clients and make it stress free for all parties involved." Hera are Fairway's Core Values that Miranda stands behind. Fairway strongly believes that the way they do things, is just as important as what they do. Every employee is guided by the company's Core Values, which are the foundation on which they work and conduct themselves. "It has always been important for me to be passionate about who I work for and how I serve others," says Miranda. "As a loan officer, I am able to work closely with my clients and help them determine the best path for their home buying or refinancing needs. It is a very rewarding experience, and I am proud to be a resource to residents across the greater Denver Metro area. Editor's Note: Stay tuned for upcoming posts on home buying tips, mortgage advice, and more from Miranda Rigali of Fairway Independent Mortgage Corporation. Guest Post Alert! This week we are pleased to feature a post from guest blogger and design consultant Catherine Collins who fills us in on the Do's and Don'ts of French Design. I don’t know about you, but when I think of French interior, the first things that come to my mind are Versailles, piano in the corner, a bed with 1000 pillows and framed mirrors. In other words, French interiors just scream "luxury". And even though American homes are usually "not about that life" and embrace more of a minimalistic approach, there are some easy ways to "French'' them up. Even though it may appear that there are no rules in French interior design, there are some very important do's and don’ts. When it comes to the materials, feel free to use natural fabrics such as linen or cotton. When it comes to walls and ceilings, you are allowed to leave one wall completely bare, as well as to make your ceiling more interesting rather than just painting it white. Even though they are embraced, be careful not to go overboard with ruffles, tassels and floral fabrics. Also, if you have one vintage item displayed in a room, don’t surround it with similar items, but with contrast minimalistic ones. The only limit when it comes to color in French design is your preference and personality. If you want to make the room feel calm, go for the neutral colors such as taupe, white, mushroom, light gray or serene green. On the other hand, if you want to make the room more alive go for bold colors such as teal, emerald green, peacock blue or even red. ​However, make sure you include one feature wall on which you will include distinctive French patterns such as signature fleur-de-lys. This is where you can truly incorporate the extravagant French design. 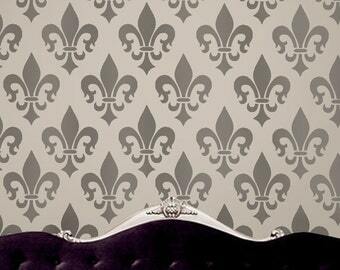 If you are not into fleur-de-lys, you can opt for Baroque or Rococo wallpapers, or even Toile de Jouy if you are into muted vintage looks. The most common French floors are either out of hardwood or stone. However, they tend to upgrade them by adding either contemporary or traditional area rugs, depending on the overall design. Never underestimate the importance of rugs and carpets – not only do they add softness and warmth to the room, but they also play a big role when it comes to the insulation of sound. Speech and steps echo are definitely things you don't want inside your luxurious place. If there is one thing I love about Parisian apartments, it is definitely the beauty of those lush architectural features such as cornices, wall panelling and soaring ceilings. Of course, not every single French home has these assets, and adding this historic trim to the 80s-styled home just isn't possible. However, if you are lucky enough to own some original features in your home or sky-high ceilings, make sure you show them off. Show off your mouldings with the lighting, show off the height with high curtains and never cover up your panelling with a busy gallery wall. French just love to mix old and new. A typical French family usually has a stunning old art object somewhere in their modern room that represents its showstopper. If you don't own anything like that, go shopping for some vintage décor pieces such as crystal chandeliers, golden framed mirrors etc. and display them in the center of your living room or bedroom. You’ve seen the Eiffel Tower, you’ve seen the Versailles and you’ve seen the Sacre Coeur. Now, what all of these have in common? I’ll tell you right away: both landscape and interior designers had a lot of work. While Frenching up your place, you shouldn’t just stop at the interior – your home needs to look chic on the outside as well. I like to recommend to people to display some big decorative house numbers that really bring a wow effect and knock people off their feet. Besides this, take care of your façade and take special care of your front yard (consider turning it into a luxurious garden. ​Have fun upgrading your soon-to-be luxurious paradise.